Explore the awesome high-rise NINJAGO® City! Join the other citizens at the traditional fish market. Make a phone call, walk over the bridge and go for a boat ride. Take the elevator and check out Lloyd Garmadon and Misako’s cool apartment. Get some cash from the ATM and go shopping in the clothes and comic book stores. Select your meal from the conveyor belt at the rooftop sushi bar and enjoy the spectacular view. Whatever you choose to do, you'll never be bored in NINJAGO City! 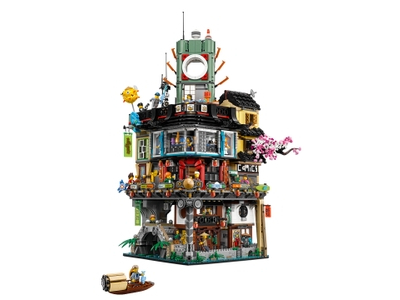 The NINJAGO® City (70620) Lego set is available from the sites below. However, they do not offer delivery to your selected region. The NINJAGO® City (70620) Lego set is no longer directly available from the sites below. However, 3rd party partners of these sites might still have the set available. Alternate description Live the life of a ninja in NINJAGO® City!